Slavs were the first to start the ethnic & national conflict in the eastern Adriatic. One of the least known issues in the conflict in Istria and Dalmatia between Italians and Slavs turns out to be who or what started it. In fact, until the late eighteenth century in the Republic of Venice peoples of the lands of Istria and Dalmatia lived in harmony under the Venetian Republic. To the point that the "Schiavoni" (as were nicknamed the Slavs in Venice) were among the major supporters and defenders of the Venetian Republic when was attacked and submitted in 1797. Suffice it to recall what happened in that year in the Bay of Kotor(Bocche di Cattaro), where the banner of Venice was buried among the cries of neo-Latin and Slavic people who shared the common pain of defeat. Istria for centuries had been divided between "Venetian Istria" (the area west and south of the peninsula) and "Austrian Istria" (the area north-east): in the Venetian Istria in the late eighteenth century the neo-Latin element was completely dominant, while in the Austrian Istria the Slavs had settled numerous (with even some Istrorumanians) making a reduced minority with a strong presence of neo-Latins. We all know that the French Revolution brought many ideals, one of which was the concept of nation that is also based on a common language. We note then that Napoleon's troops in the eastern Adriatic shook the secular status quo of the peaceful Istrian - Dalmatian society and consequently in the nineteenth century there was the rise of Italian and Slovenian-Croatian nationalisms, which harbored - among other things - even the two bloody world wars of the twentieth century. Today the ultranationalist Slavs defend themselves against accusations of having exterminated south of Trieste almost completely the Italians, claiming that this was done as a reaction to the attacks of the fascists in their "Fascist Era" (called "Ventennio" in Italian) and at the beginning of World War II. While the Italians accuse Austria of being the root-cause of violence by the fascists because of having favored the Slavs in Venezia Giulia and Dalmatia until the First World War, to the detriment of Italian community with numerous abuses (and deaths) since the times of the Italian independence wars. But who or what started all this? That is, who were those who threw the "first stone" ? The answer lies in the creation of the "Illyrian Provinces " by Napoleon. 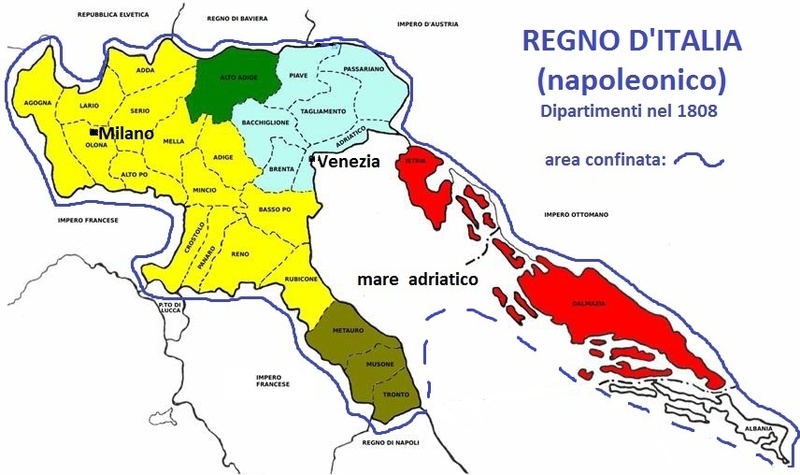 In fact, after having joined Istria and Dalmatia to the Napoleonic Kingdom of Italy in 1805, Napoleon decided to create this new balkan state after a few years (with capital Ljubljana) and to annex to it these two regions that had been part of the Venetian Republic for centuries. But for Istria there was the opposition of the people (almost all Italian at that time), supported by the Viceroy of the Kingdom of Italy Eugene de Beauharnais, who wrote directly to Napoleon to get -or better, to keep- the union of Istria (already Venetian for centuries) to his Kingdom of Italy. Unfortunately arrived from Paris only the permission to join to the Kingdom of Italy just the forests and salt marshes of Istria (which were about 20% of the territory of Istria) ..... and in this way for the first time in many centuries Istria was detached from Italy. The inhabitants of Pola, Rovigno and Capodistria protested, but there was nothing to do. It should be noted, moreover, that Beauharnais in his letter to Napoleon wrote that "Your majesty (i.e. : Napoleon ) already had included Dalmatia between the Illyrian Provinces but Istria, always Venetian, it was excepted to remain Italian" (http://www .coordinamentoadriatico.it / fil ... ). So we have a clear-cut change in the thinking of Napoleon in his decision about Istria! What or who changed the decision of Napoleon about Istria? Officially it was -among other things- the need to determine as the eastern border of the Kingdom of Italy the river Isonzo, but in reality this was due to the influence of the Enlightenment group of the Slovenian "Circle of Zois " who had a lot of weight in Paris (then capital of the Enlightenment). The so-called "Circle of Zois" was the most important center of Illuminism in Ljubljana and was founded by Sigmund Zois. This Zois (whose father was a Lombard from Valtellina) was an important patron in the arts and sciences, by funding numerous publications and scientific projects. But above all he is remembered for having contributed to the codification of the Slovenian language (until then considered only a Slavic dialect) and done by Zois and members of his circle (who became even promoters of the first newspaper in Slovenian language: the "Lublanske novize" - "News of Ljubljana"). To this circle belonged among others, the linguist Jernej Kopitar, the historic and dramatic writer Anton Tomaž Linhart, the poet Valentin Vodnik and even the French Charles Nodier (related to the famous Joseph Fouche, one of the leaders of napoleonic Freemasonry). And in these Masonic connections of the Circle Zois is to be seen the "key" that explains the main sudden change of Napoleon, who - as is clear from the letter of Beauharnais - initially wanted to keep united the former Venetian Istria to the Kingdom of Italy. In January 1810 was so secret (or "Masonic") this change, that is remembered by historians like Bernardo Benussi that " Marshal Marmont requested confirmation to Caulk (head of the Provisional Government of Istria http://arupinum.xoom.it/govprov.htm ) about the desire of Napoleon to detach from the Kingdom of Italy the region of Istria, making it a part of the Illyrian Provinces. The Caulk asks for confirmation to the government of Milan, which was blinded about the imperial will and falls from the clouds." In short, this "sudden and unexpected" change appears to be the first demonstration of a Slavic methodology -repeated and expanded in the following decades- to seize , with stratagems and often fakes well set up, and annex all that was Italian in Istria and Dalmatia (from literature and history, to the Marco Polo nationality..... until ownership of the properties of the Italian exiles after 1945 (the reader should study this interesting article written in English by Dino Veggian about these appropriations: http://researchomnia.blogspot.com/2014/0 ... ) . The removal of Istria from Italy was perceived as an offensive strike by the Italians in the region: it was the first time that there was a rift in the ex-venetian Istria between the majority of Istrian Italians and the slavic minority (then very small). Unfortunately, this fracture - as we know - became more and more huge in the following decades degenerating into open conflict, until the terrible conclusion in the famous "Istrian exodus" of the Italians. From all this clearly we note, in simple words, that the Slavs were the ones that started the ethno-national conflict in the eastern Adriatic. The Slavs of the Zois Circle threw "the first stone", when they obtained to annex "suddenly" the former Venetian Istria to their Illyrian Provinces against the will of almost all stakeholders (from the viceroy Eugene de Beauharnais to the vast majority of the local population who was Italian) ! 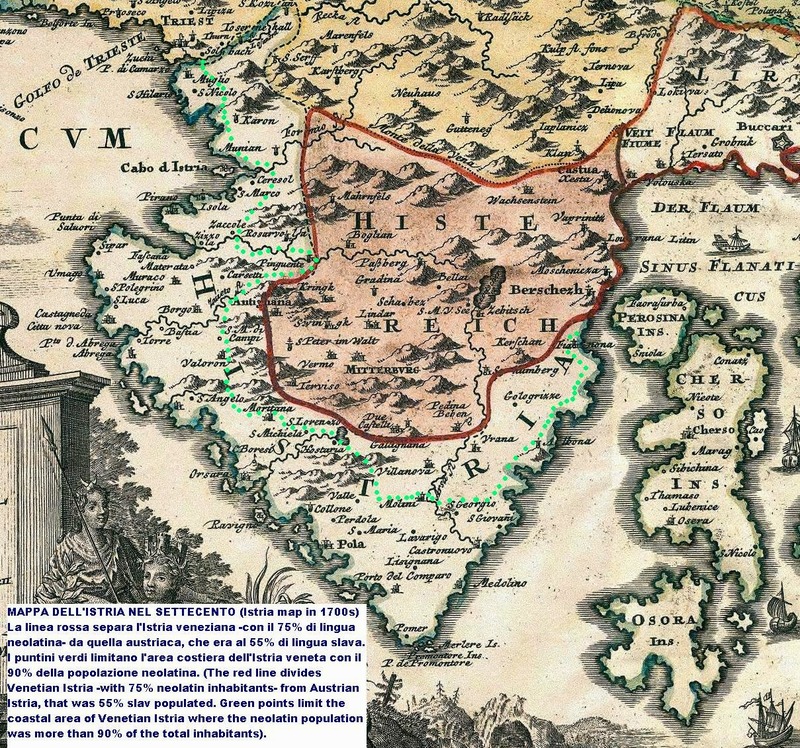 It should also be pointed out that at the time of the Napoleonic Istria, Istria was divided into the ex-Venetian Istria (from Capodistria to Pola, where the vast majority was of Italian ethnicity) and the former Austrian-Istria (the area of Pisino, with a reduced Slav and istrorumenian majority) and was plagued by the phenomenon of banditry in the countryside. One of the few bright spots of the French occupation, in fact, was that their efficient war machine dealt a severe blow to this ancient scourge of Istria. It was particularly harsh the repression of brigandage in Ciceria (implemented in 1810 by the " Battalion Royal d'Istria ", made mainly of Italians from ex-Venetian Istria), where it was applied the principle of "collective responsibility", meaning that villages in the surroundings where operated the robbers had to respond in a severe way or through the delivery of hostages or through a ransom if the culprits had not paid the innocents. So because the majority of these brigands were Slavs, since that moment the brigantage repression started a clash between citizens of the villages & cities (Italians and pro-French) on one side and farmers (Slavic and pro- Austrian ) on the other side: this was a typical feature of Istria at the time of nationalism during the late nineteenth century and early twentieth century.